Former Owner, The Sewing Bird, Inc.
Anne Schout joined the College of Education Board in 2013. She holds a bachelor’s degree in chemistry from UNC-Chapel Hill and an associate degree from St. Mary’s Junior College. Most recently, Anne worked as owner and CEO of The Sewing Bird, a fiber arts store in Charlotte, North Carolina. 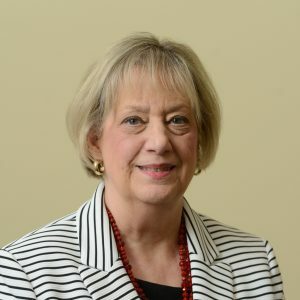 Her past career includes serving as an endocrine cancer researcher for the chairman of the Department of Medicine at UNC-Chapel Hill and as an analytical cChemist with the N.C. Department of Agriculture and with Collins and Aikman, Inc.
Anne’s philanthropic interests include education, humanitarianism and historic preservation. She has been an active volunteer in numerous organizations in Charlotte and New Bern, including Mint Auxiliary, Hezekiah Alexander Auxiliary, the Hezekiah Alexander Foundation, the Myers Park Homeowners Association, the New Bern Preservation Foundation, the Duffyfield Phoenix Project, and the New Bern Historic Downtown Residents Association. Anne is an avid wearable artist and musician. She and her husband, Jim Schout, have been married for 41 years and live a recently-restored historic home in New Bern with their two wonderful dogs.